Dice Clubs - FAQ : Play Dice Clubs! 1. What are the emotes? Emotes are a new way to communicate with your opponents. Before sending your move, you can select one of the collected emotes and attach them to your move. The other player will see it at the beginning of their turn and will have a chance to respond! 2. How can I get the emotes? You already have four basic emotes! You can unlock more with Coins in the ‘Your Emotes’ section of the game. 3. How can I send the emotes? Every turn you can send one emote to your opponents. Before you select the field with points and finish your move, press the small ‘speech bubble’ icon next to your portrait, select an emote that you’d like to send and that’s it. 4. Can I disable the emotes somehow? Sure you can. Just press the small ‘speech bubble’ icon next to your portrait and select the ‘Disable emotes’ field in the bottom right corner of the screen. You can always enable them later by pressing this field again. 1. How can I invite other players to my club? To invite a player to a club you must be a member of an open club or a leader of a private one. – press the ‘Invite to club’ button and an invitation will be sent! The player can now join your club! 2. Is it possible to be a member (or a leader) of more than one club? Unfortunately, no. You can only be a member or leader of one club. 3. How many people can be in one club? Each club can have maximum 10 members. 4. Is it possible to remove inactive players from the club? Yes. but only the Leader of the club can remove players. It doesn’t matter if the club is “Private” or “Open”. 1. Does Dice Clubs have stickers? Of course! You can access them the same way that you’re accessing other stickers on your iOS device. Just select the Messages app and have fun! 2. How can I send stickers? Stickers come with the Dice Clubs app on every iOS device, you don’t have to install anything else. Just open the Messages app and start a conversation. At the bottom of the screen, you should see a Dice Clubs icon. If you don’t see it, press the button with three dots and then select Dice Clubs from the list. Now simply select the sticker that you want to send and tap it! 1. The videos for free Diamonds aren’t working. What can I do? If you’re playing on an Android device, please try resetting your Google Advertising ID. We have found two different ways to do so. 1. Open the Google Settings. 3. Tap on the “Reset advertising ID” option. 4. Tap on the “Reset advertising ID” option. After you reset your ID the videos should start running again without any problems. 3. Tap ‘Advertising’ at the bottom. 4. Tap ‘Reset Ad ID’. Videos should work correctly now! 2. My friends have devices from different manufacturers. Can we play together? “Dice Clubs” is available for iOS, Android, Windows 8 and 10. You can play together no matter what device you or your friends are using. You can even invite them to a match directly, using the Friends mode. 3. I’m experiencing connection problems. What can I do about it? If you’re using a wireless network, please deactivate Wi-Fi on your device and try again. That’s the easiest way to check whether the problem is caused by the network that you’re using or our servers. If the Wi-Fi is the cause, please try reseting your router. If the problem persist, we suggest configuring your router to the Google-DNS. Here’s a short description:DNS Konfiguration. P.S. Also, your internet will run faster after this configuration. If you weren’t able to solve the problem, please contact us via e-mail: support@binteraktive.com. 4. Help, I forgot my password! In the Your Account section of the Main Menu you’ll find the Restore Account button. When you press it, you’ll see the Forgot your Password? link. Just enter your e-mail address there and we’ll send you a new password. Did you have a password or an email address connected with your account? – If yes, look in the menu for the ‘Your Account’ section. – There, you will find the “Restore Account” option. – We also need the exact number of Diamonds that you have. 1. Why do I need a profile? Securing your profile with a password and username will make your account much safer. You can personalize your profile and even add other players to your friendlist. Should you ever forget your password it’ll be easier for you to request a new one. 2. Why should I connect my Dice Clubs account with Facebook? When you connect with Facebook, your progress won’t be lost; it’s the same thing as securing your account with an username and password. If you log in with Facebook you also easily play with your friends. 3. What happens when I connect my Guest account with a social media account? All the progress made on the Guest account will be lost – you’ll have to start again from scratch. It’s much better to do it immediately when you start playing Dice Clubs! You can set up username, e-mail address and password in the menu. 4. Can I upload my own profile picture from the gallery? You can also use your social media Profile Picture as soon as you connect your account with Facebook. The moment you connect your account with Facebook, your profile picture will automatically be changed. 5. My Facebook profile picture isn’t displaying correctly! How can I fix it? If you’ve changed your profile picture and the old one is still displayed, it’s probably a caching issue. That means your new profile picture will probably already be displayed correctly to other players, but not to yourself yet. It may take a while for the new profile picture to appear on your screen. What you can try first is a logout and a subsequent registration with Facebook in our app. 6. I’ve changed my username but the old one is still visible! You probably forgot to confirm the change by pressing the OK button next to the text field. Sometimes, however, the old username is still visible even though you’ve confirmed your new one. Restarting the application will fix this issue. 1. How can I get points for my second (or third) 5x? 2. What are the Upper and Lower Points? The Upper Points is the sum of points that you’ve earned with fields 1,2,3,4,5,6. The Lower Points is the sum of the values in the ‘figure’ fields like Full House, Streets and Three of a kind. 3. What’s the Bonus and how do I get it? 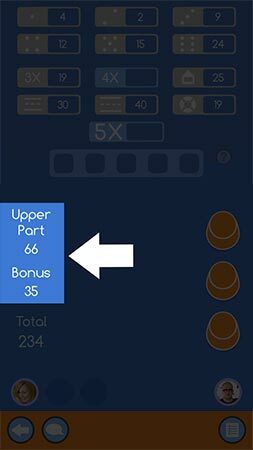 If you’re able to score 63 or more points in the Upper Part you will earn 35 extra points. Please note: If you’re able to collect 3 of each number (1-6) your score in the upper section is exactly 63. 4. How can I roll the dice? There’s a few ways to roll the dice. You can shake your phone like a real dice cup. Tapping the screen of your mobile device works just as well. 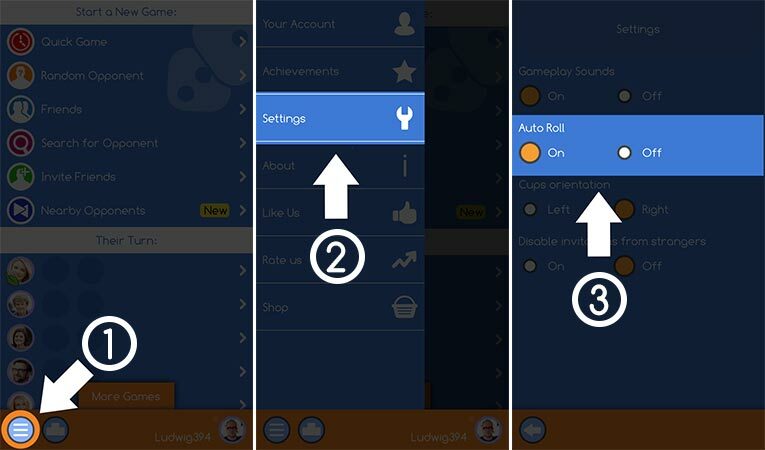 Additionally, you can activate the Auto Roll feature in the Settings section of the Main Menu – the game will do the job for you. On the desktop PC you just have to press the left mouse button on the cup and the dice will roll. 5. Is there a limit to the number of games I can have open at the same time? Yes – the limit is 30. If you want to start some more you’ll have to finish some of the open games first. 6. Is it possible to close and remove a game before it ends? Not really! Just like you, your opponent has 36 hours to make his or her move. If he or she won’t make it in time – the game will end for them and you’ll win. You can finish the game by yourself and try to beat your highscore. Another option is to close the match by clicking on the small arrow in the bottom left corner. Remember: always try to finish your games – you’ll get Diamonds at the end! 7. What’s the difference between Quick Game and Random Opponent modes? In the Quick Game you’re playing a complete game with three other Players. You all have 1 minute to make your move and you’re all making them at the same time. Whoever won’t make it in time – will loose. It’s an exciting and unique real-time Dice Duel! Random Opponent mode is the classic turn-based mode. You’re playing against one opponent and each of you have 36 hours to make the move. 8. I want to play a match with three friends. Is it possible? Sure! Just invite them using the Friends mode on the menu screen. You can invite up to three friends to one game. Don’t forget to send the invitations by pressing the START button! 9. I want to play a Dice Duel match with one of my friends. Is it possible? Of course you can also invite your friends to play in the Dice Duel mode. It is important first that you and your friend you want to invite already reached level 20. This is the normal mode you already know. That means you can invite up to 3 of your friends to play a round of Dice Clubs. The winner gets a maximum of 4 diamonds. And you will find the option Dice Duel. 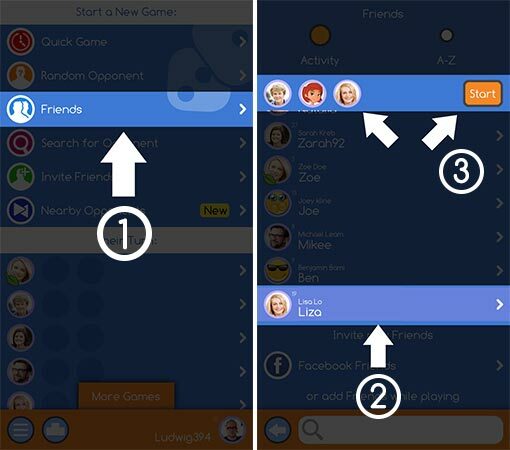 Search here for the friend you want to invite to a game. Choose the fee of the game and the invitation will be sent to your friend. If your friend accepts the invitation, the game for more diamonds can start. 10. Is this a reallistic dice mechanism? Yes, totally, absolutely, 100% reallistic. The throw results are an effect of randomization just like in the real life. Each Player has the same chance to win, no matter their Player Level, gender, amount of Coins and Diamonds, game mode or any other factor. Of course, a bit of luck could help, but the chances are always equal. 1. How can I get Diamonds? There are many different ways to get diamonds. First and foremost, every 11 hours we’re giving away some diamonds for free. Don’t forget to open the game and collect them every day! The higher your player level is, the more diamonds you’ll be able to collect for free. If you don’t want to wait, you can always purchase one of the many packages of diamonds in the shop. Last but not least, you’ll be reward diamonds for playing and winning games! Especially in the Dice Duel mode. There you can win a lot of diamonds in just one game! 2. How many Diamonds do I get for winning games? It depends on the game mode that you’re playing. In a Quick Game and a match with a Random Opponent you’ll be rewarded 2 diamonds for winning. Playing against your Friends will allow you to earn some more diamonds – even up to 4 for winning a single match! 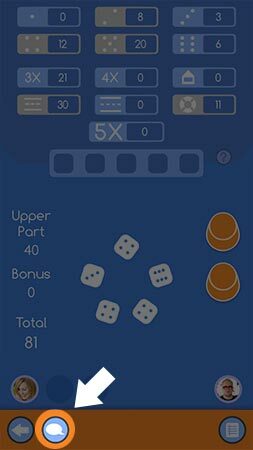 And finally, there’s the Dice Duel mode. Here you’ll be able to earn high amounts of diamonds (100 or even 10000 per match!) but only after you pay the Entry Fee. 3. What’s the Dice Duel mode? The Dice Duel mode is the most exciting one in the game. It allows you to win much more diamonds than any other game mode. 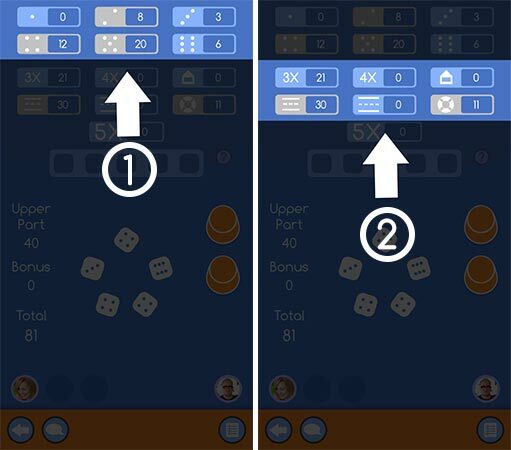 To play against random opponents from all over the world in the Dice Duel mode, you have to first reach player level 5. Then, all you have to do is select a ‘table’ that you want to play in and pay the entry fee. Currently, there are 5 tables with different prizes – starting with 11, up to even 5500 diamonds. Keep in mind that with the high reward comes also risk – the winner takes it all! Additionally, winning games in the Dice Duel mode is rewarded with Medals. Show them off! 4. While playing in the Dice Duel mode, my opponent stopped responding. Can I still win the game? Of course! You and your opponent have 36 hours to make a move. If your opponent misses her or his turn you’ll be able to finish the game by yourself and get your reward! 1. What are those coins and how can I get them? You can earn coins by completing missions. You’ll be rewarded with coins for completing the club missions as well. Coins can be exchanged for special, animated cups and die. There are two types of Missions: Daily and Weekly. There are various objectives to fulfill and doing so, will reward you with Diamonds and sometimes even Coins. 3. How do I start a Mission? 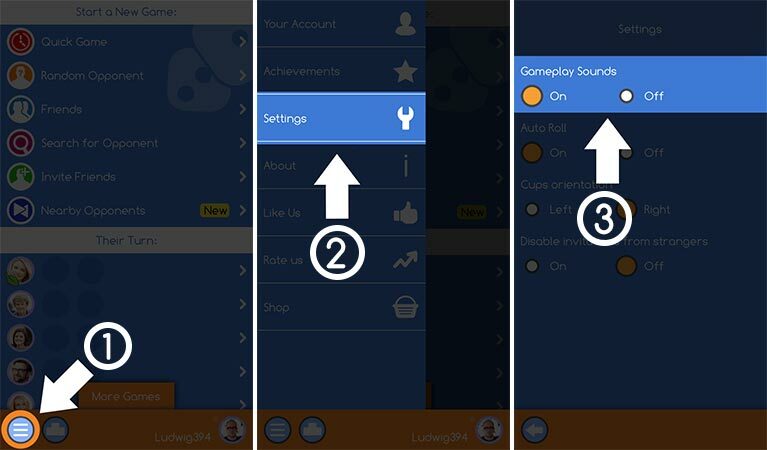 Missions start automatically – just play any game mode (keeping the Mission objective in mind!) to complete them. To read more about the current Mission objectives, just press the Mission bar in the main menu! 1. How do I level up? You’re gaining Experience Points when you win games. If you get enough Experience Points, your Player Level will go up. Remember that you’ll gain much more Experience Points for winning a game than finishing it on the 4th place. The higher your Player Level is, the more Experience Points it requires to level up. 2.How can I get Medals? You will be rewarded with medals for winning games in the Dice Duel mode. Each medal requires a certain number of victories. For example, you need 10 wins for the first medal, 20 for the second, 30 wins for the third medal, and so on. This applies to all five categories (11 Diamonds, 55 Diamonds, 275 Diamonds, 1100 Diamonds and 5500 Diamonds) in the Dice Duel mode. It’s a bit different after you get your 100th medal. From then on more and more victories are needed to get a new medal. Also, note that from 100th medal, you will not get bonus Diamonds anymore. 1. Where can I activate/deactivate the sound effects? Check out the ‘Settings’ section of the Main Menu. You can access the Main Menu by pressing Menu button on the left side of the game list screen. There you can activate or deactivate the sounds. 2. Can I disable the cup animation? Sure. Just open the ‘Settings’ and activate the ‘Auto Roll’. 3. I’m a left hander, is there an option to switch the cups to the other side? 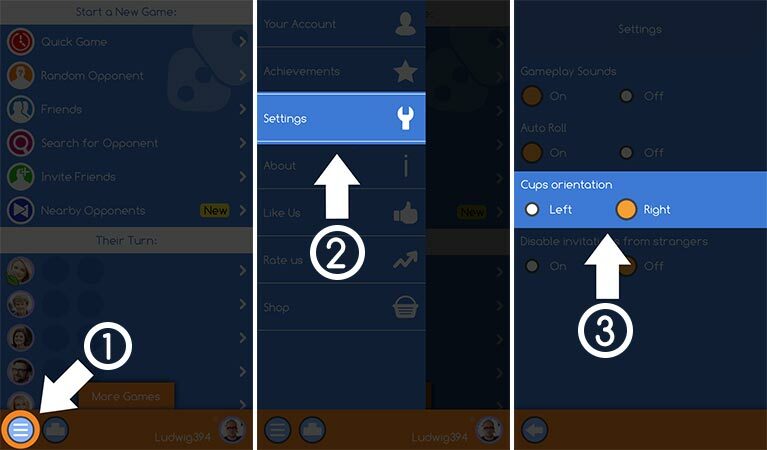 You can switch the orientation of the Cups in the ‘Settings’ section of the Main Menu. 4. Is there an option to deactivate the ads other than paying for it? 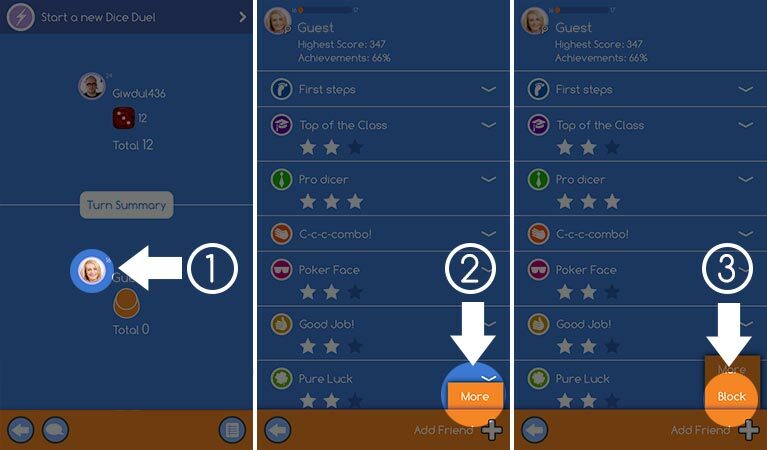 Just connect your account with Facebook and invite a new friend who never played Dice Clubs before. Start a match with him or her and finish it. Per each friend that you invite and play a game with you’ll disable the ads for 7 days. 1. I’ve met a really mean player… what can I do? First and foremost: don’t react to the insults – ignore the chat. Dice Clubs is about having fun and mean behavior is neither welcome nor appreciated. Additionally, you can block a certain player permanently; he or she won’t be able to play and chat with you ever again! 1. Open the player’s Profile by tapping on his or her portrait or avatar. 2. Press the ‘More’ button in the lower right corner of the screen. 3. Press the ‘Block’ button. Of course, you can also contact us. Please send us an e-mail at support@binteraktive.com. Screenshots of the chat and username of the player will be very helpful! We’ll take care of the rest. 2. I’m getting many invitations from people I don’t know. Can I disable it somehow? 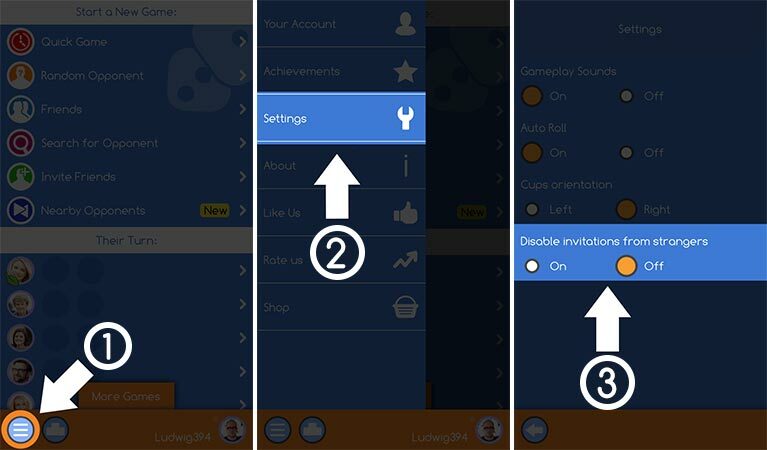 You can activate and disable invitations from strangers in the ‘Settings’ section of the Main Menu. 3. When can I chat with other people? First, you have to reach level 5. From then on you’ll be able to chat with other players by pressing the chat button (it’s in the lower left corner) during a match.